Clearly, the overall quality of its ale has not declined since its Diamond Geezer won beer of the festival at my local Twickenham Beer Festival in 2012, and the range has expanded. The most obvious change though is the brewery tap - when last I was there, probably two years ago now, founders Alex Bull and Chris Mills simply put some casks on gravity alongside the brewkit, plus some bottles and glasses on a table, and they opened to the public one Saturday a month, if that. They have now moved all the fermenting vessels - and they are up to five of these - into a second industrial unit nearby. That has freed up space to put in a proper bar, done in the modern 'recycled wooden chic' style, along with four hand-pumps, half a dozen keg taps and a couple of small fridges. There's even a few tables and stools, a table-football game, and not one but two loos! The five-barrel brewkit is now behind Perspex, and they are open six days a week for off-sales (bottles), with the bar open Thursday-Saturday. Head brewer Alex says that while some 85% of their business is still cask, there are many places that want to offer a locally-made craft beer but which only have keg lines. So they are also using 30-litre Keykegs and Ecofass kegs - the former are disposable while latter are reusable. Both types are in effect a giant bag-inna-box, with the beer in a plastic bag inside the keg. Alex explains that although they are physically kegs, the beer is still pretty much 'real' - it is not carbonated or served under pressure; instead it is brewery-conditioned and primed as you would for bottling, and forced out by compressed air injected between keg and bag. "Beer definitely can condition - undergo a secondary fermentation - in a keg," he adds. We were able to try half a dozen ales, in all three dispense forms. 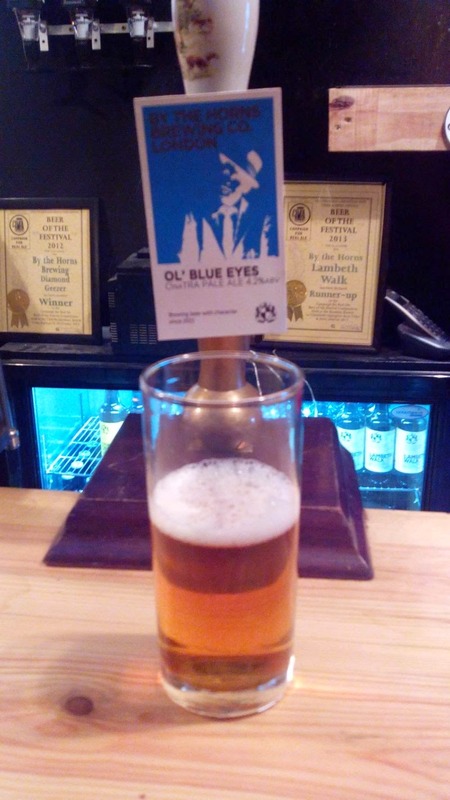 Stiff Upper Lip, a bitter golden ale, was on cask, as was a new release called Ol Blue Eyes CInaTRA - this is brewed with Citra hops as the name implies, and is in the modern pale ale vein, with tropical fruit notes to complement the citrus bitterness. On keg, we tasted Bobby on the Wheat - I was a little reluctant as I'd not found this especially interesting in the past, but it turned out that while the name's the same, this is actually a new recipe. Now at 4% ABV, it's a dry-hopped wheat ale, sort of like a hopped-up Hefeweizen Leicht. It has a refreshing hoppiness and a lightly spicy body. Alex says he's pleased with the new version: "The extra carbonation lifts it a bit, and the dry hopping works better." 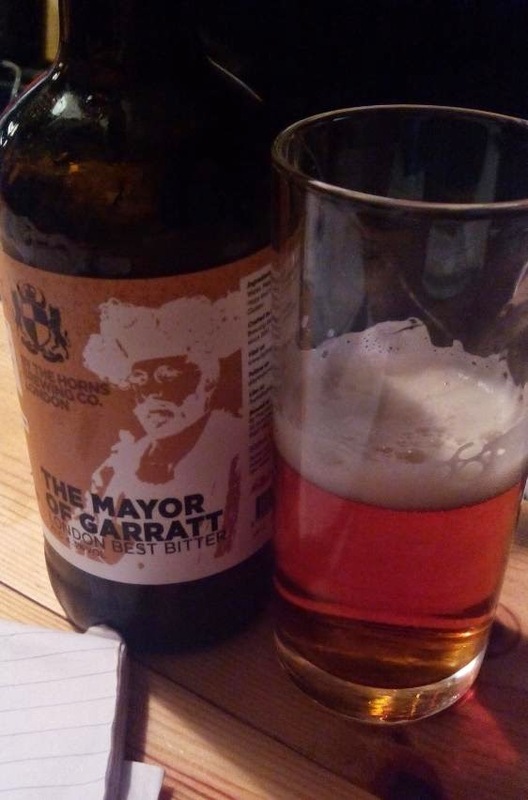 And from bottles we tried Gift of the Gab, Lambeth Walk, Mayor of Garratt and Hopslinger. The former is a coffee milk stout - Alex says it starts as just a milk stout, made with British Pioneer and First Gold hops, and is then aged on oak and freshly ground coffee for two weeks. As well as some chocolate malt, I spotted some roast barley in there too - the latter is what gives Guinness and some other stouts that burnt-bitter edge. The result is delicious, anyway! Lambeth Walk is a rich caramelly beer with hints of cocoa and toffee. It's sold as a London Porter, which I'd tend to go along with, but one or two in our party felt it was closer to Old Ale in style. Hmm! Mayor of Garratt is a toffeeish and faintly nutty London-style bitter, and last but not least, Hopslinger is Alex's interpretation of an American IPA, with plenty of dry hoppy bitterness plus touches of toasted orange and tropical fruit. All in all, it was a very enjoyable couple of hours and it provided a good catch-up, both on By The Horns specifically and on the state of craft ale in London more generally. Thanks again, Alex!